As all of you SHOULD know, I’m working with Fat Tone Guitars on the first Effects Bay contest give-away. Fat Tone Guitars was kind enough to donate a SubDecay F-Bomb prototype fuzz pedal to the contest, where one lucky contestant will walk away with this sweet fuzz! If you’re interested to win this pedal, you still have time! Just head over to the Pedal Give-Away Contest blog post for more details! Some of you asked what this F-Bomb is all about, since it is a prototype. Phil from Fat Tone Guitars was kind enough to put a little review together about this particular pedal. 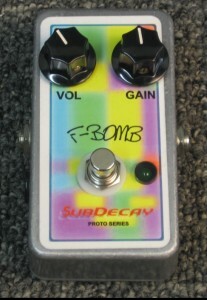 The production Subdecay F-Bomb fuzz pedal currently available is a high gain, mucho distortion pedal that really goes to 11. According to Subdecay, The F-Bomb is for filthy rock tones and by tweaking the knobs, you can get tons of tones—from all out fuzz mayhem to more discrete bluesy overdrive. In my experience, the production F-Bomb really packs a huge wallop. Make sure that the knobs are low when you plug in your guitar as it’s all out gain. The Subdecay F-Bomb Proto we have here is a mellower, polite fuzz pedal that allows more of your guitar tone to shine through. It is not a hugely versatile fuzz but the tones that it delivers are tried and true and sound great playing both rhythm or lead. The F-Bomb Proto has 2 knobs–volume and gain, along with an LED indicator light. The volume control is useful all the way up till it’s dimed and can allow you to adjust for both single coils and humbuckers. Playing with the various levels of volume vs. gain on the F-Bomb proto can provide lots of tonal variation. There is less variation on the gain knob but it is completely useful through the full dial. As the Gain knob is dimed, more of a violin quality of the pedal comes out, especially when playing single note runs. This pedal is a lot of fun. Use the volume vs. the gain to really dial in your tone and to adjust for your guitar. Don’t miss out on this contest, and submit your entry today! EHX Factory TourQuestion? Leverage the Effects Bay community for an answer!